Almost speechless about this Strawberry Mousse in a chocolate-dipped cookie cone at Landtmann’s Patisserie in Vienna at the Cafe Museum. And yes, you are seeing lightly toasted almond slices on top. Working (sleuthing) to get this recipe. The many strawberry desserts in Vienna may not enjoy the same fame as Sachertorte (see story below) but they do grace the pastry cases with timeless appeal. I’m collecting my favorite classics, including a few strawberry delights, for A Baker’s Passport. Strawberry desserts are popular in all European cities this time of year because the berries grow throughout the European countryside and much of the world. Bloomberg ran a good piece focusing on California strawberries, too, which account for almost 30% of the world’s crop. I’ve included it below. Otherwise, back to work. I really love that strawberries and viennoiserie are somehow part of my job. A few years ago, during his commute across California’s Pajaro Valley, Phil Stewart began stopping more regularly at the Burger King in Watsonville. He wasn’t just there for the Whoppers. He was visiting a wild strawberry plant. Stewart, an affable 41-year-old with sandy hair, breeds the fruit for Driscoll’s, the largest player in the $5.6 billion U.S. berry market. He was struck by the plant’s vigor—sprouting at the edge of the sidewalk without much water or soil, blanketed in the exhaust of cars waiting at a stoplight. Stewart dropped in on it for two years, waiting for it to fruit. When at last he found two small berries on the plant and tasted one, it was delicious. Strawberries grow almost everywhere in the world, though nowhere as bounteously as they do along this particular stretch of the California coast, about 95 miles south of San Francisco, where the Pajaro River empties into Monterey Bay. The Spanish explorer Sebastián Vizcaíno, anchoring nearby in 1602, found wild strawberries in December, which was unheard of in Europe. Explorers to other parts of the New World also discovered strawberries with marvelous advantages in color, size, and flavor, and took botanical specimens home. Two of these crossed to yield the modern strawberry, Fragaria x ananassa, in the 18th century. But this is not a festive time for the industry. For decades, growers used methyl bromide to kill off bugs and diseases in the soil; hired cheap labor from Latin America; and enjoyed plenty of water. Yields and profits went up in a straight line, as strawberries became a large, firm, uniformly red supermarket staple and global commodity, cheap enough to pack daily into a breakfast smoothie or a kid’s lunch. Yield per acre in California has increased almost fivefold since the 1950s. Each of those advantages is now disappearing. It turns out that methyl bromide, a chemical introduced as a pesticide in 1932, eats through the ozone layer. Following the 1987 Montreal Protocol, the U.S. is finally coming close to a complete phase-out. Labor is in short supply and getting more expensive. And no one knows how long the California drought will last or how the state will fix its water problems. The state’s strawberry acreage has dropped about 4,000 acres in the past two years, a decrease of 11 percent, as some growers have abandoned the fruit. This is what pulled Stewart back to the Watsonville Burger King. He’s always on the hunt for plants that will help him create the strawberry of the future, tough enough to thrive with less water, less care, fewer chemicals. 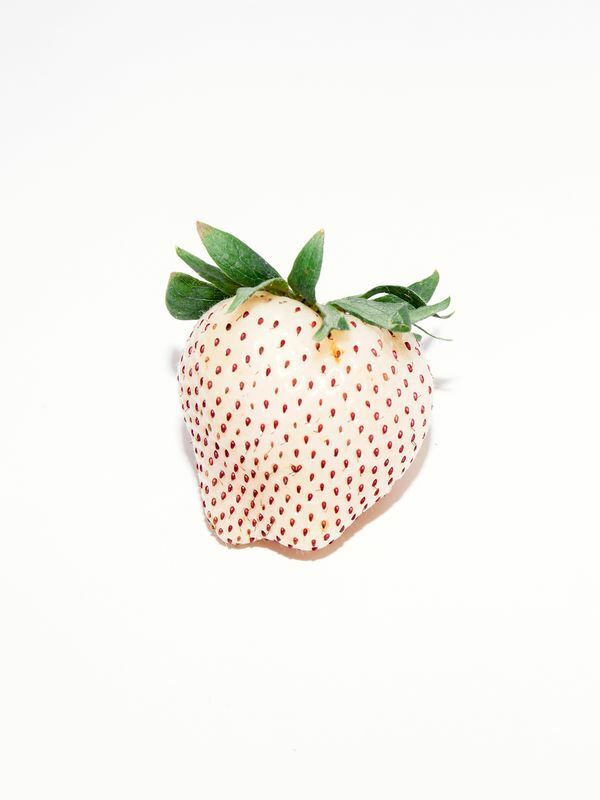 In 2009, impressed by the sidewalk strawberry’s will to survive, Stewart plucked one of the berries for its seeds and drove it five miles down the road, where Driscoll’s runs one of the biggest strawberry breeding programs in the world. Driscoll’s breeding program predates the company itself. In 1944 a group of strawberry farmers founded the Strawberry Institute of California, dedicated to the development of new and better varieties. Driscoll Strawberry Associates, formed as a grower’s cooperative in 1953, merged with the institute in 1966, and got out of physical farming. Since then, the company has focused on the two ends of the supply chain. Driscoll’s has a staff of 30 scientists devoted solely to strawberries, manipulating evolution at nine research stations in Watsonville, Southern California, Florida, Spain, Mexico, and the U.K. The company provides seedling plants to contracted growers. Then, when the growers harvest the berries, Driscoll’s packs, ships, and markets them to retailers. The growers get 85 percent of the revenue; Driscoll’s keeps the rest. Driscoll’s is a private company and family-owned. The chairman, Miles Reiter, is the third generation of Reiters to run the business, and his daughter manages operations in Chile. Driscoll’s doesn’t disclose financial data but estimates that it has 34 percent market share of U.S. strawberry sales—48 percent in organic. Bjorn says Driscoll’s brand name helps command as much as a 30 percent price premium over competitors. It can charge that much because Driscoll’s, more than any other company, has created the strawberry as most know it: large, uniform, bright red, firm, and available 365 days a year. “I didn’t realize how complex it was until I really got here and saw it up close,” Bjorn says. Consider the berries you expect to find at Whole Foods Market, one of Driscoll’s top clients. As soon as they’re picked, they are inspected and graded on size, color, and sugar content; chilled; and trucked out to customers within hours. It takes about four days by land to get berries to the East Coast. By the time you see them at Whole Foods, five to seven days after picking, the berries must be just the right shade of shiny red—not dull, and not too color-saturated, either, because consumers think too deep a color means the berries have started to spoil. They should be plump and pleasingly heart-shaped, with perky green crowns and no browning leaves. Strawberry lovers are exacting. Each container Driscoll’s sells in the U.S. and Canada has a code on the back that tracks variety, grower, and harvest date. Originally a food safety measure, it’s become a way for Driscoll’s to test the market. Consumers can enter their codes on Driscoll’s website and tell the company what they think. People actually do this, and Driscoll’s learns interesting things. For example: The most avid strawberry buyers—Bjorn calls them “heavy” and “super heavy,” like grades of crude oil—often buy conventional strawberries for themselves and organic strawberries for their children. 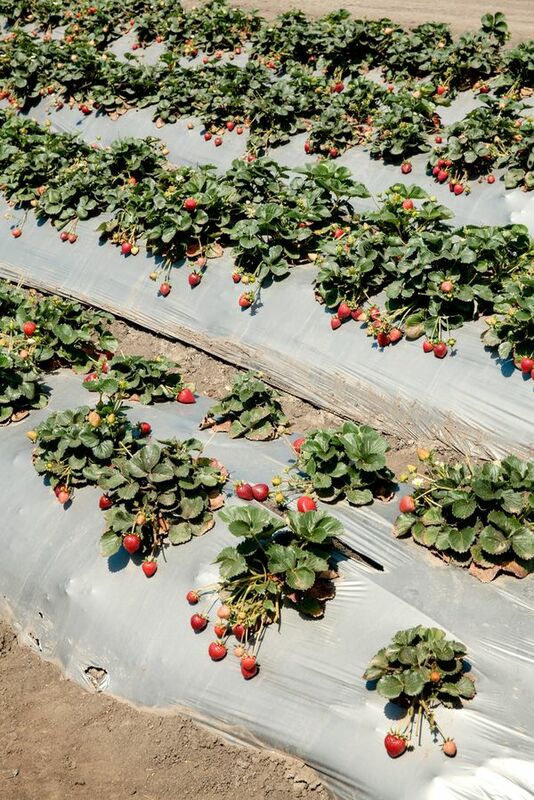 In Driscoll’s test field in Watsonville, the strawberries run out toward the hills in straight lines, two rows to each raised bed, each bed coated in silvery plastic and shimmering like mini highways in the sun. By mid-April, the plants are sprouting thickly: crowns of juicy green leaves dotted with ready-to-pick red berries, light green ripening fruit, and white flowers. Amid the leafy abundance, five beds stand out like a desert island, with meager stunted rings of yellowed leaves, barely poking out of the earth. They’re in a section that hasn’t been treated with chemicals for 15 years, and it took Stewart and his team some time to figure out what might be wrong. Eventually, they found elevated salt buildup and did some additional irrigation to flush the soil, but the plants haven’t caught up with the rest of the field. Stewart does a formal walk-through two mornings a week, snaking in S-curves through the rows with his two assistant breeders. Each block of plants, made up of siblings with the same parents, has its own bar-coded white plastic nursery tag, which he scans with a Bluetooth device that transmits data on the family to an iPad. Promising plants are marked with a white comment card attached to a stake, where the breeders jot down observations each week in tiny squares: tart, M+L (medium to large), FC (full color). 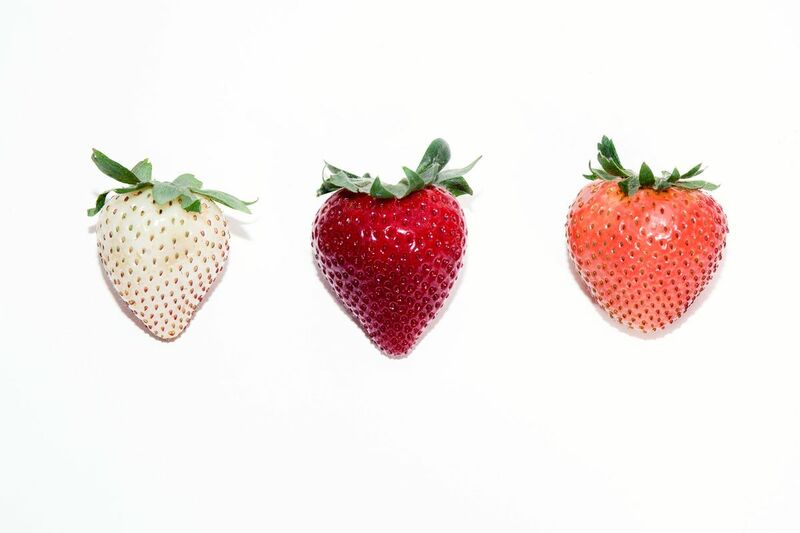 For a little berry, the genetics of the strawberry are astoundingly complex. Humans have two sets of chromosomes, making inherited traits such as eye color relatively easy to predict. The modern strawberry is octoploid—eight sets of chromosomes—and has a correspondingly huge increase in possible combinations that are expressed in qualities like flavor, size, color, and firmness. Stewart starts a new breed by crossing two parent plants in a greenhouse. When the new plant is large enough, it sends out tendrils called runners, which Stewart and his staff pin into pots. The runners sink roots and grow into daughter plants that are exact genetic matches. He starts with about 27,000 genetically distinct seedlings growing in the test field in April. About 1 percent of those get replanted for a second year, and fewer still see a second, third, and fourth season in some of Driscoll’s other test plots. Just one or two will graduate to testing in commercial fields, and, if all goes well, Driscoll’s will name a new strawberry and release it to its farmers. Driscoll’s doesn’t dictate to growers which of the company’s varieties to plant, so the new must compete with the old. Stewart has been doing this since 2007. His first breakthrough was the Del Rey strawberry, released in 2009. It’s now the company’s most-planted variety. Growers like it because it’s not too bushy and the fruit hangs off to the side, which makes it easy to pick. Stewart demonstrates, cupping a nice red strawberry in his palm, with the stem between his forefinger and middle finger, twisting it off without pulling at the plant. The average life span of a Driscoll’s variety in the U.S. is about three years. Two others introduced by Stewart in 2009, Adelaide and Anita, haven’t survived. Adelaide had excellent flavor but yields petered out later in the season. Anita, a sibling of Del Rey’s, seemed to have good disease resistance in the test phase but fell prey to an outbreak of Verticillium wilt after release, destroying confidence in the variety. The most recent selection, Big Sur, gets good reviews from consumers for its flavor, despite a tendency to bruise. It outproduces Del Rey, but, being bigger and bushier, also takes longer to pick, so growers must weigh higher labor costs against a larger crop. Stewart grew up on the other side of the continent, in Cuba, N.Y. After graduating from a local university with a degree in biology and no clear plan for his future, his mother’s cousin’s husband invited him to apply for a summer job at Cornell University’s college of agriculture. He ended up spending five years working with grapes. After that, he says, “I always knew I wanted to be in fruit.” His Ph.D. work at the University of Florida focused on strawberries. Stewart has a taste for abstruse subjects. He’s been fascinated by ancient Egyptian hieroglyphics since the fifth grade, and is good enough at deciphering them to translate, when the need arises, for a friend in London who’s an antiquities dealer. More recently, he’s taken up the study of the Rongorongo script, found on a small number of artifacts from Easter Island. He brings that same intellectual bent to his work as a strawberry breeder. He likes going back to older varieties, and these experiments are obvious in the test field, where a patch of Fragaria vesca ‘Alexandria’ towers over the other plants in its bed, displaying tiny, jewel-like berries. The species is highly disease-resistant but almost impossible to cross with modern breeds. “I tend to have to be careful not to be distracted by all the cool stuff,” Stewart says. His competition, though he wouldn’t put it that way, is the strawberry breeding program at the University of California at Davis, which dates to the 1930s. (Its founders, Harold Thomas and Earl Goldsmith, decamped for the Strawberry Institute, which later became Driscoll’s.) Highly productive UC Davis varieties such as Tioga in the 1960s helped push yields in California steadily up. A man named Douglas Shaw ran the program from the mid-1980s until 2014, becoming legendary for such breeds as Albion, a blockbuster that many consider the tastiest of the California varieties. When not in the field, Stewart works at Cassin Ranch, a cluster of low-slung buildings and greenhouses three miles back across the valley. Stewart is especially interested in using older and unusual strains to handle environmental pressures. As fertilizer deposits accumulate and water tables drop, the soil in California is getting saltier. In one of the greenhouses at the ranch, beneath huge fans that fill the glassed-in space with a lawn mower-like summer drone, he’s running a salt tolerance test. A metal table holds 365 plants, fed with drip tubes running into the black plastic planters. Most look unwell, with scorched brown leaves. Five at the end, though, have beautiful, glossy green leaves—this is F. chiloensis, one of the wild ancestors of today’s cultivated strawberry, and the species native to California’s beaches. None of a strawberry’s many traits matters much without flavor. Stewart runs flavor assessments twice a week from mid-May through late August, using his colleagues as testers. He also eats a lot of berries himself, taking a bite out of as many as 200 a day. After I taste and rate them all, Stewart tells me which is which. Del Rey I liked the least—it’s too sweet, maybe too soft. My favorite is Big Sur, Stewart’s most recent commercial variety. And I also liked one that turns out to be the competition, a UC Davis variety called San Andreas. Stewart describes it as “crunchy,” something he tries to avoid but which has its uses when you need a strawberry that will produce and ship well from April through the high heat of the summer months. One of the varieties stands out on looks alone: a white berry with red seeds. White strawberries were once common; to get that color, Stewart used material from the White Carolina, developed in the 1700s. It’s one of the oldest varieties for which there is still genetic material, maintained at the U.S. Department of Agriculture’s DNA bank in Corvallis, Ore. There are desirable traits associated with white, including resistance to rot and disease. Stewart’s white variety—so far unnamed—is about five generations in. Driscoll’s sells it in Hong Kong, where there’s a market for expensive white fruit. Stewart also used to bring them home when his kids were younger—white strawberries don’t leave stains behind the way reds do. The noble line of the Burger King strawberry isn’t represented. Stewart selected two seedlings grown from the seeds he took from the original plant, evaluated small test plots, and made some crosses with other types. The tasty berries were marred by extreme seediness, and he dropped the strain after two generations.